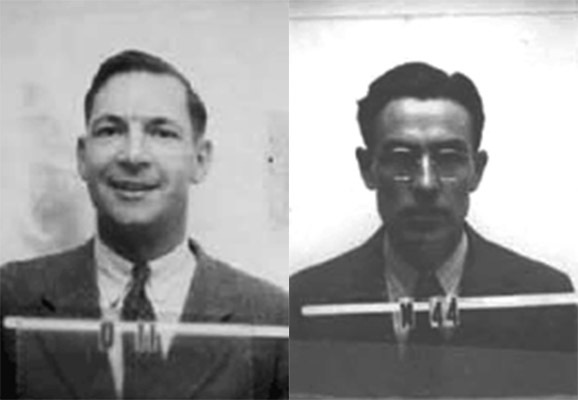 Harry Allen and Robert Van Gemert worked in procurement at Los Alamos during the Manhattan Project. In this interview, the pair discusses getting ready for the Trinity test, the challenges of using Jumbo, and how materials were transported safely and secretly in and out of Los Alamos. They remember helping to acquire the lead-lined tanks used to transport scientists to the blast zone after the Trinity test. Allen and Van Gemert also discuss the dormitories at Los Alamos, how the Town Council handled problems, and the secrets of PO Box 1663. They recall their interactions with leading scientists including Emilio Segre, Enrico Fermi, and Edward Teller. They actually went ahead and started cutting hair down there in the old cyclotron building. Van Gemert: We must have some other droll purchasing that must have happened. That particular one I remember. Allen: The most interesting thing from a technical point of view, today in connection with any kind of a nuclear test purse, you know how they order coaxial cable at $3.00 a foot, and it’s been engineered and it’s specially designed for this kind of a frequency or for that kind of a waveform and so forth. Well, nobody knew anything about coaxial cables in those days, and all that instrumentation was done with old twisted bare telephone cable. Allen: In some cases, and they put some fence posts in, with a wooden cross on it, and tacked old style porcelain insulators with a nail through them and held the wire around that. Allen: You put the wire in between them, the hole—two wires, in there and pound the nail down. There’s a hole through them that the two parts go together so the wire can’t get in, and it’s insulated. As Van says, we bought barrels and barrels and barrels of those things, all we could find all up and down the west coast. Van Gemert: Harry, they also used down there – they went out and chopped down the taller cactus plants, and they sort of trimmed them down a little bit and planted those damn things and used them for what we would call telephone poles. That’s in the short run, wherever they had the damn stuff all over the ground. Groueff: The cable would go in—? Allen: You’d thread the three or four, at least, sets of twisted pairs in a fifty-foot section of garden hose and bring it through. Then you’d thread the next garden hose on. Allen: Keeps it dry. It’s not a bad idea for another reason. Over in Conchas, I put up a sixty-five, seventy-foot TV antenna, put that thing on there and ran the regular flat antenna cable out, and the wind whips that stuff and sets up vibrations. So finally, I took a piece of garden hose over there and put my TV lead in inside it, and took the garden hose and strapped it to the pole on the way down to get down the roof. That is a good cheap protection, because the regular cable costs a fortune. But that’s a good practical idea, if you’re having trouble on a tall tower with your TV antenna. Groeuff: How was the procurement organized here? Allen: We had a teletype up here, and we had it on a direct wire to an old teletype machine out in the middle of the desert down at Trinity. We used to go down there, and that was when I learned how to operate a teletype machine with one finger on each hand, and you can do this pretty well. We’d send messages back and forth, because telephone communications were spasmodic. We were operating probably the biggest truck line in New Mexico at that time, after dark. We had forty-two or forty-three Army drivers assigned to us and one civilian driver. We would start two or three truckloads of stuff at about 6:00 at night from up here. They would go down and get off the main road and start into the desert before daybreak. They would go in and they would sleep all day down there and drive back the next night for security, so they wouldn’t see everything going down in that direction. Van Gemert: But you had some interesting procurement set up to keep this place secret, too. Groueff: How was it organized, the overall project here? Allen: Everything was shipped— we had something called the Calexico Engineering Works with the Los Angeles address on Venice Boulevard. Allen: The C-A-L was California, and the E-X-I-C-O was New Mexico. Everything was shipped in the warehouse to that Calexico Engineering Works. Van Gemert: Even if it came from New York City, wasn’t it? Allen: Well, we had another place in Chicago that picked it up that way, and took off the source labels and everything and readdressed it to us out here. Groueff: So you had your representatives permanently stationed in Los Angeles? Allen: New York, Chicago, Los Angeles. Groueff: And the center was here? Groueff: You had a special division here for procurement, no? Van Gemert: This was the director of all the procurements, you see, was really headed up here. Groueff: And several people working for that, was it the big job? Continuous, every day, you had to—? Allen: There were several hundred buyers, something like twenty-five buyers in New York and twenty-five buyers in Chicago and 100 in Los Angeles. Groueff: And how would it work? For instance, somebody at the laboratory, let’s say Dr. King needs something. He would apply for that? Allen: He’d send out a request. Groueff: And you people, it’s your business to find it? Van Gemert: That is right. Allen: And send it to one of the appropriate purchasing places some other place. Van Gemert: Well, we would go out and get it. Allen: It was amazing what they got, absolutely fantastic and how fast. The priority was based on the date you put on the request initially. If he gave us a substantial amount of time to get this item— like in those days, it was considered a substantial amount of time, anything over three days. Allen: But if they gave us thirty days, it would carry a lower priority. So just a lot of detail in this situation. Groueff: No, but what I mean is, how did it compare to other military projects? Allen: We had a standard number one military priority. Allen: AAA. We could assign those from here. We also occasionally would go out and get a directive, and that we had to go to get; we had to go back to what we called the Washington Liaison office. We would call either Major [Robert] Dunning or Major [Jack] Derry. Allen: In Washington, yes. Jack Derry is today head of one of the AEC [Atomic Energy Commission] Departments, Division of Administration or something back there. Jack Derry is head of Engineering Construction, which covers procurements and so forth. Bob Dunning eventually ended up in charge of the engineering for the AEC of Los Alamos. He died up here about two years ago. Allen: Oh, we were talking about the vehicles. Those vehicles were very scarce, and those came into Kerazoza addressed to the US Corps of Engineers. I remember sending a crew over from Trinity to there to get them, bringing them directly into Trinity there. We had to unload them off freight cars, and there was no loading ramps. We had the old broken down crane, and that is a difficult job. We got two M4, M3 tanks, which had the old nine-cylinder continental radial aircraft engine put in the tanks. That was an air-cooled radial engine, and in that tank, it was cooled by a great big old fan that took about half the power. Those tanks were up here, and they were fixed up and lined with lead for a recovery mission. That was probably one of the first manipulators that was ever put on anything for use with radioactive material. Theoretical, Ernie Anderson and his crew after the shot were going out immediately into the area to make recoveries in these lead-lined tanks. Those tanks were real dogs. We loaded them on freight cars in Santa Fe. We went down and unloaded them in Pope, New Mexico, and drove them across the desert thirty or forty miles. Knocked down a couple of gates and through some fences and so forth. One of them got lost, and there was always one of those tanks that wouldn’t start. The standard equipment with them was a piece of inch and a half steel cable about ten feet long, and you’d pull one tank with the other to get it started. True to form, they took off the morning after that shot to go out there, and they pulled the second tank and got it started. About a quarter a mile down the road, the first tank just died, and the second one went out most of the way. They had an awful lot of trouble with it. As I remember it, they finally just abandoned them both and walked back. Groueff: Why did you need those tanks? Allen: Well, they were lead-lined to protect the people from radioactivity, and of course this was the first shot. They knew theoretically there was going to be a lot of radioactivity around, but they didn’t have any idea what they were talking about. Groueff: So they were for the personnel to go in to? Allen: Well, an area where there was some radioactivity. Van Gemert: And incidentally, to recover the samples. Allen: Samples to see how much radioactivity there was, picked up film holders and various metals and check them out. From the amount of radioactivity on various different metals, they would be able to know what kinds of radioactivity came out from the device. One of the deals that they had, they had a cylinder about four feet long and a foot in diameter, buried four or five feet in the ground, about 100yards from zero point down there. It had various sensitivities of film on it. We went down with a grain truck about a week later and went out there one night. It had to be recovered at night because the film would be exposed during the daylight hours. It wasn’t a camera device, it was just film in this thing. We went down and recovered that, and I can remember how cold it was. We finally got the thing pulled up out of the ground, and the technical people with us took the film out and put it in proper holders to protect it from light. We went back and we had gotten enough radioactive dust, dirt on us, so we had to take a shower out in that open desert under a cold water tank and change all our clothes. Boy, that was cold. Then after they got back and started developing the film, they found out that they had underestimated the amount of radioactivity. All the film in there, every piece, was just dense black. All they knew was the minimum amount that they must have gotten, when it was realized at the time. Groueff: I understand when the work was done with different metals to determine which one would be the best for the tamper, among other things, they tried platinum and gold. Do you know how and from where this gold and this platinum was found and procured? Allen: As far as I know, any discussion, even today, of tampers is classified. Groueff: I don’t know, I saw it in the [David] Hawkins book. Actually, he says platinum and gold were abandoned, but they were tried. Allen: Oh, wow. There was no problem actually with our priority in getting either platinum or gold in the quantities, and we’re not talking about a lot of it. Allen: Yeah, there was about $75,000, $80,000 worth of platinum in a piece. Groueff: Where you get so much platinum, from the industry? Allen: Yeah. We have in our stock room right now out here, I could take you out and show you $175,000 or $200,000 worth of platinum in sheets just that we carry as standard stock items all the time. Van Gemert: But I was trying to recall, how in the devil did we go about getting that stuff at that time? Allen: The platinum we got from Baker, I’m almost sure, back in New Jersey. David Mitchell got the gold through a government channel, again through the Washington liaison office. There’s no problem, actually. Today, if you have a legitimate need for gold, if you wanted to get a bunch of gold for some scientific purpose. For instance if somebody came in today and told us they needed enough gold up here so that Jim Tau and the metallurgical section could cast them a gold plate four feet square and an inch thick, we could get the gold here in a week without any troubles at all. Groueff: From the Treasury office? Groueff: This is standard procedure. And platinum—? Van Gemert: Platinum is even easier. There’s no government regulations on platinum. All you need to get platinum is the money. Groueff: But you have to pay for it? Van Gemert: Yeah sure, but it’s not used in coinage. Allen: Platinum isn’t used in coinage and there isn’t very much in the way of government controls on platinum. Van Gemert: That you can get. You probably had more troubles with wire and stuff like that. Van Gemert: Electronic parts in particular. Of course in those days we were still using the conventional electron tubes. Allen: Vacuum tubes and this kind of thing could be real difficult to get. Van Gemert: The transformers and chokes and condensers and these things were hard to get, because all of the other agencies were using them, in the Signal Corps and the Air Corps and so forth. Allen: Basically, all these things are made up of metal parts, special steels. For instance, transformers and chokes have one grade of special steel in it. When the steel industry gets busy, why, this is a nuisance item and it was really scarce. Then there was the question of the copper wire and electron tubes, the nickel grids and plates. Groueff: All of these were in demand? Allen: The whole metal industry—regular metal industries— were just loaded down with orders. So these little component parts, which in themselves didn’t amount to much, were scarce, and this was why tubes were in short supply. Light bulbs were in short supply. You know, even incandescent light bulbs were in real short supply because of tungsten films. Van Gemert: As a matter of fact, the war production board controlled industry by simply controlling three basic metals, essentially: copper, steel, and aluminum. By controlling those things and the production and what things went for and who could get them, they essentially controlled it. For instance, if they wouldn’t give an office furniture manufacturer steel to make his furniture, he couldn’t do it. Therefore, they could direct him as to what he could do. Groueff: So those three metals were controlled? You couldn’t buy them freely? Groueff: Then you can control the whole industry. Allen: —you control the whole industry, right across the board. Allen: Without copper, you can’t make motors, you can’t make control gear, you can’t make anything without copper. Groueff: But your needs couldn’t be planned a year ahead. I mean, they were coming just like that so every week. Van Gemert: You’re absolutely right and it’s a real interesting point. As a matter of a fact, the needs weren’t planned a week in advance. Although the plans were there as to what they were going to do, they didn’t know exactly what materials they really could work with. They would start off in a direction—as an example here, the case you brought up a moment ago about gold and platinum. They tried it and it didn’t work, so they would throw it out and next week they would go to something else. Sometimes, to be quite frank about it, they would tell us, “Go and get a certain kind of material.” We would go and get it. By the time we got it, they would be off working on something else and forgotten about this. Allen: This even happens occasionally today. Van Gemert: This is an extremely fluid thing. Groueff: Did you work those problems with the leaders of every division, or centrally through Oppenheimer’s—? Allen: Oh no we would go directly; no, we wouldn’t bother Oppie [Robert Oppenheimer] on things like that. We would work with Bacher or [Kenneth] Bainbridge, or whoever was concerned about the particular problem. [Seth] Neddermeyer, [George] Kistiakowsky, whoever was around, we would work directly with them. Groueff: Do you remember some amusing stories or colorful anecdotes about some of those standards and the way they were? They were so different, each one, some calm, others temperamental. I’m looking for a maximum of anecdotes. Allen: I can remember old Emilio Segre used to walk from the Tech Area to his house reading the newspaper. He would walk right by his house and get down, and he would suddenly look up and he would turn around and he would be reading on the way back. By this time, his wife would be out on the back porch screaming at him. Allen: But anything like that should be used with discretion, but that’s the truth. He’s up at Berkeley. Allen: Wonderful person. He was calm. Fermi was the most commonplace man in this world. I mean, you would see Fermi walking around. Groueff: Easy to work with? Allen: Very easy, very quiet, and never excitable. Van Gemert: The man we talked about earlier here, this photographer—without mentioning names, you know—over in Madison, Wisconsin was one of the wildest ones. He would get ideas and boy, he wanted things to happen now, and he would really get excited about things. I was just trying to think of what it was. The funny thing is, we went out and bought something and sent it out over to him, he never would send it back because it was the wrong item. He would keep that and demand more in addition. Oh God, he was an excitable man. It was Julian Mack. Allen: But actually, most of the nuclear scientists were really calm, nice, easy to get along with. John Williams. Allen: Earl Long, easy to get along with. Groueff: Did you work with [Hans] Bethe? Groueff: Just supply chalk and a blackboard? Allen: All he needed was a paper and pencils. Van Gemert: And a calculator, a little desk. Allen: The only time we ever did anything with Edward Teller, he had an idea one day, he wanted to find out about a big cast iron sphere that he wanted made. It was 100 feet in diameter and two feet or three feet thick or something. How could this be done and how many pieces would it take? We spent a couple of days going into the practicability of even approaching this, because a two-foot thick piece of cast iron was pretty hard. So after coming up with a total weight involved and some of the practical difficulties, Edward apparently decided he would have to solve his problem some other way. But most of those people of that caliber, were mainly indulging in theoretical fancies and theoretical end of the work. Groueff: They had no experience with industry or procurement? Groueff: Many of them were so young. They were twenty-eight, thirty? Van Gemert: Came right out of the universities and the classrooms and so on. They had no touch or brush or rub with the practical side of things at all. Allen: Who was the tall thin boy whose wife was in the TB place down in Albuquerque? Groueff: I saw him in Pasadena. He seems to be quite a practical joker. Allen: Oh. He was the one whose wife was in the institute. She had TB rather badly and she was down in Albuquerque. In those days, they censored all mail up here, incoming and outgoing. Feynman used to write his wife letters in cipher and she would write back in cipher. It just drove those security people nuts, because they didn’t know what to do about it. They didn’t know what the communication was going back. Feynman, of course, was a very, very smart man. Wonderful mathematical mind. He could read these ciphers just like you or I would read English. These other people, oh they had a problem with him. He was a great practical joker. Van Gemert: Did you ever run into any problems, Harry, where just knowing people and being a good scrounger paid off rather than going through the War Production Board? Van Gemert: It must have been even more so then. Real midnight recquisition-type stuff. Van Gemert: I was wondering if you had any amusing incidents of that sort you might remember? Allen: Let me see. I have trouble remembering. Van Gemert: We should be able to remember these; people come through to write books about every two or three years. Allen: I’m going to write a book myself just to pass out to people that want to come up here and talk to us; that would be a good idea. Van Gemert: Write a book on the people that come through to write books. Allen: Whatever happened to the last gentleman you squired around here? He was up here with his wife and living in Frijoles [Mesa, New Mexico], and he had an article for “Time” or “Life” or something. Allen: For the Jumbo. Eight feet in diameter. Van Gemert: There was a trailer that was made to receive Jumbo at the Pope Siding. At Pope Siding— you can look it up in the railroad almanac, it’s just a sign, is all it is. There’s no station. Allen: The only railway station in New Mexico that has got a name and standing there and looking in any direction, you can’t see a building. Van Gemert: There’s nothing there. Allen: You can’t see anything. Van Gemert: 240 tons. It looked like a huge milk bottle. Did you see a picture of it? Groueff: Yeah, I saw the picture. Allen: What they didn’t want to do, was lose the very valuable and scarce material by just having it blown around by the explosion, in case there was no fission. You see, they wanted to save the fissionable material in this container, so they could recover it and reuse it again. Of course, as it turned out, they got more and more confidence in what they were doing, and decided it would do more harm than good to set it off in there because they would lose a lot of measurements and so forth. So they went ahead. I’m just as glad they took it out of there, Van, because we were lying on the ground only about three and a half, four miles away, I guess, something like that, from where that thing went off. If they ever set that off in Jumbo, that would have blown pieces of Jumbo all over everything. Groueff: That would have been like a bombardment? Allen: With little pieces of hot metal coming down and they would be hot two ways, radioactive and warm. Actually, after they had buried this in the ground end first, they did blow up one end of it with an explosive charge. Several years after this, I—in the direction of the people up here who were interested in trying to see if it could be salvaged, the AEC—we flew a general contractor, who is a heavy hauler, and somebody from Consolidated Western Steel, Los Angeles— down to take a look at that cargo plane to see if indeed it had any salvage value. The conclusion of everybody was, it sure had a lot of salvage value if it was sitting some place reasonably close to a railroad track. But the way it was, it would have had to have been to get it out of the hole in ground, it would have to have been cut out and moved across and it would cost about three or four times as much at a minimum as it was worth as such. So it’s still sitting there. Van Gemert: It’s been cut up. It’s been cut up and just buried—I think they took the top off. Allen: They may have cut the top off of it. But most of it that I know is still down there. Van Gemert: In the desert, yes, just like Julian Mack’s instruments. Allen: We talked about the flexibility of programs. I think one of the greatest or best attributes you could find in a person at the time, particularly a person in the purchasing end of things, was being able to move and shift with the request. Specifically, they would give us requests and we got hundreds of them every day, you know, for the most exotic things that you could imagine. Allen: But that still happens, but not nearly as frequently now, because things are much more stabilized. Van Gemert: We’re not going off in as many directions simultaneously as before. Allen: We hope we know a little better what we’re doing. Van Gemert: And what we can expect, what kind of results to look for, and so on. Groueff: How about the City Council? What was the City Council? Allen: It was called the Town Council. Of course, there was no governing body, as a civilian governing body, up here. This was a sort of and very irregular Army post. There was a commanding officer. But he wasn’t really responsible either for the functions of a civilian governing body. They had an election and they elected some members. They had a Town Council set up that sort of made its own rules and had no authority whatsoever. For instance, if anybody was driving an automobile too fast, if the MP’s [Military Police] picked him up and he was a military man, they could handle him through military channels. If he was a civilian, all they could do was tell him to slow down, you see. They used to bring some of these traffic cases over to the Town Council. Groueff: Because you didn’t have a police, regular to give tickets out? Allen: There was no authority whatsoever for this. That Town Council went on for four or five years, actually. Van Gemert: That was one of the problems they took care of. Of course, they took care of the problems in connection with the commissary about why they couldn’t get better quality vegetables or more meat or fresher vegetables or butter and so on, or bread. All of these things were brought up through the Town Council over to the military because the military people—when I say the military, I mean the military people in charge. They were fought out through that line. Another bunch of problems was the collection of garbage, people complaining about it not being picked up. Or the firing of the furnaces. That was another thing that the military people took care of. U.S. Engineers and somebody complaining to the council about not getting their furnace stoked or another neighbor squawking because the guy that was stoking the furnace was making too much noise at 4:00 in the morning. Just endless problems. Groueff: Who was the head of the council? Van Gemert: I was the chairman at one session, where we had Mrs. [Marguerite] Schreiber was on and Viki [Victor] Weisskopf was on. Harry was on the council, I know, at one time. Allen: Yeah. I was on for two different terms. Van Gemert: You got on by election. People elected you. Groueff: So you acted as a municipal council? Van Gemert: You acted as a listening post for these complaints to take to the military, to have something done about it. Groueff: Who was the real mayor of the military? Van Gemert: Well, Lt. Col. [Whitney] Ashbridge was the Commanding Officer. Allen: He was the man that had to do something about things. Groueff: So you would go with your problems to him? Allen: It actually got so Col. Ashbridge sent his operations officer—he would send a Major over to sit and listen to these complaints and make notes and go along with a guy, get as far as he could. But I suddenly thought about a real good story. Van Gemert: They was a meeting every night about the complaints. Allen: Van, do you remember all the complaints about the dormitories? They had men’s dormitories and ladies dormitories, and then they had one they used to call a single couples dormitory. Van Gemert: Did he leave or join her? Allen: There was the Major up there. Major George Selfinger, remember? Allen: He said he would look into this and investigate these statements and so forth, and report back to the Council next week. So George came back next week. He said he regretfully was forced to report that he had investigated these incidents and he decided it was half frustration and half imagination. Groueff: It was a dormitory for women only? Allen: Yes, there were several for women only and several for men. Groueff: This man had no business to be there. Allen: He had a friend over there, I guess. Things were a little loose in some lines in those days apparently, like they always are. But in those days, I guess, it was such a small town that everybody knew everybody else’s business. Groueff: What did the single man do for girls? Allen: The place was loaded. Groueff: Loaded with girls? Secretaries? Allen: Oh sure, secretaries, WACs. Groueff: So there were a lot of girls here? Allen: Oh yes. There were all kinds of secretaries from Albuquerque and Santa Fe that were brought in. People lived up here with families, of course, had daughters and such. Groueff: So that solved this problem? Van Gemert: That took care of the natural inclinations and desires and so forth. Groueff: Could you go to Santa Fe for a party? In other words, don’t get a whole bunch down there and don’t tell them about the work and don’t tell them who you are, and all these precautionary statements and so forth about your pending weekend trip to Santa Fe. I remember that. I remember particularly the first fiesta down there was an interesting little gathering. The first one I was talking about was in September 1943. Groueff: The annual Santa Fe Fiesta? Van Gemert: Yeah, every Labor Day weekend. Labor Day weekend; it starts on the Friday night and goes on through Monday is Labor Day, and it was quite a thing. Groueff: You all went there? Van Gemert: Not many of us went there. I guess you could modestly say, we enjoyed ourselves. Groueff: With the local population? Van Gemert: Yeah. You see, we weren’t too associate too much with these people. Not that they weren’t nice people, nice people to associate with. It was a lot of fun and enjoyment, they just they didn’t want too many people gathering together, you see. Allen: They took a lot of precautions to prevent any way for the names of a lot of the people up here to be associated with each other. Such things as, for instance, for the first three or four years I was here, my paycheck was sent back to the bank in Cornwall, NY, from where I had moved. Allen: In Los Alamos. This worked real well and they took care of everything except that, because of the limited facilities up here, a lot of people used the laundry service provided by one of the big laundries in Santa Fe. One of the commercial laundries used to send two or three trucks up and so forth. It turned out on his books, he had practically a complete list of everybody in Los Alamos. He had had it for a long time before anybody realized. Groueff: He was the only one to have a complete list? Van Gemert: They took this precautionary step of coding, maybe I should say, the names with respect to driver’s license, for instance. My driver’s license was issued to me by number, just a number without a name. I remember that. It said list A, number so and so. That was the identification, the unique identification that I had on the drivers license. So they protected that. Groueff: Did you drive in Sana Fe, Albuquerque, for instance, and somebody stops you, asks you for your driving license, you show that? Van Gemert: You show that, and I guess the State police had been told about it. Groueff: They didn’t know what the strange people were? Allen: They would write down “126, List A,” and this was identification as far as they were concerned. Groueff: Shipped to Santa Fe, not to Los Alamos? The word “Los Alamos” was not written on the boxes, no? Van Gemert: It was almost unknown, as a matter of fact. Groueff: Your address was Santa Fe? Allen: I’ve got a daughter, a sophomore in college down here at the university today whose birth certificate reads P.O. Box 1663, Santa Fe, New Mexico. Groueff: She was born here? Allen: She was born here in 1945. Groueff: That’s interesting to see. Van Gemert: —one of my boy’s birth certificates has rural Sandoval County [New Mexico] on the thing. Groueff: And he was born here? Van Gemert: He was born here. The whole family was born here. The two boys are in school in California and the other two children up here. The whole family was born here. A lot of interesting things you could tell about the dental service and the hospital service and so on. I remember the first child in the hospital, they kept my wife in there for fourteen days, didn’t charge at all for any of the medical service in connection with the birth. Charged me $14.00, a dollar a day, for my wife’s food and so on and stay at the hospital. Groueff: That was the hospital here in Los Alamos? Your children were born here in Los Alamos? Allen: I’ve got an older girl, but my younger girl was born in the hospital at Los Alamos. Van Gemert: All four children were born in that little hospital that is now nonexistent. Van Gemert: The early ones, the numbers are rural Sandoval County, that’s all. They didn’t talk about Los Alamos at all. Allen: For some reason they put—Dorothy’s shows P.O. Box 1663 Santa Fe, NM. Allen: University of New Mexico thought this was hilarious when she entered.